In late 2015, Alpine Plywood began stocking Glenwood Beech Kitchen Kompact cabinets. If you’ve been looking for a sleek, affordable cabinet line, Kitchen Kompact is the solution! These cabinets allow you the opportunity to offer customers QUALITY CABINETS at the LOWEST POSSIBLE PRICES, with INVENTORY READILY AVAILABLE right here at Alpine Plywood! 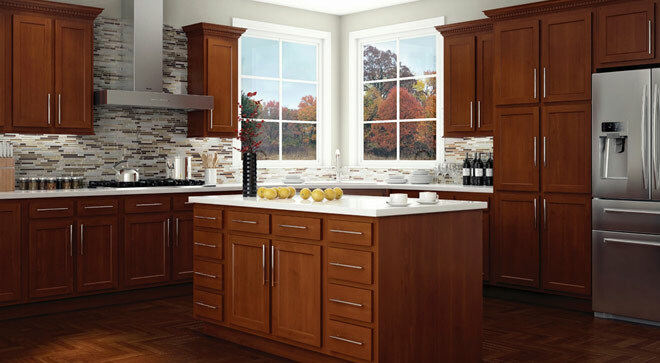 Glenwood Beech cabinets are a darker, chocolate color and have an up-to-date Shaker style. The clean, well-defined edges and recessed panel doors bring a touch of elegance to a home or apartment. Why offer Kitchen Kompact cabinets to your customers? For more information or to view a sample, contact a sales team member today at (800) 236-6324!